Sometimes we get a misguided student who views massage therapy as a fun little job that pays you a lot of money working in a beautiful spa. School, for this student is a necessary evil for which they are willing to put in the bare minimum effort. Once out and working with clients they often can’t keep a job or they hurt themselves because they ignored body mechanics coaching. Usually youth is a factor as well as complete ignorance of what it takes to be a superb professional massage therapist. Allow me to enlighten you! Professional massage work requires an enormous amount of responsibility. MTs are privy to personal medical information. One must understand the weight of this information. You become privy to it because it is important for you to know. You must make decisions about whether massage is appropriate or even safe for each individual client. You learn to think critically about medical information in school which is why it is important to be present and tuned in for each class. In addition to safety and modifications decisions, MTs must try to contribute positively to each client’s health and well-being. The client has typically given you an hour of their life’s time to achieve some goal. I think every MT should meditate on this periodically. This is an awesome task given by a client who views you as a professional who will take the responsibility of carefully using that precious and limited time very seriously. Finally, there is money to be made, but it’s a happy exchange when the MT has worked hard to do the best for the client. This includes focused attention during a session, study between sessions to research and practice, and a commitment to improve. This is not an easy little fluffy job. This is full-on professional work that has great power to improve people’s lives, but only when massage therapists embrace the responsibility they have been given. And this begins with massage school. Are you a grown up? Ready for an amazing professional life? Come join us! I found this review of a massage provider online and I thought it might be instructive here. I have talked about informed consent before and the legal obligation it requires, but obviously the law is still being violated in this respect much to the detriment of clients, employers, and the profession at large. I’ve also talked about “deep tissue” work and how it is a misnomer and also inappropriate to apply deep massage work universally. But I haven’t addressed the business aspect of this unlawful and destructive behavior. Do you see above the last sentence with the client’s emphasis on NEVER? I would hate to think any massage therapist, no matter how disgruntled with an employer, would do this to a client to wreck the business, but that is exactly what will happen here. This client has posted this review online and he/she will definitely tell anyone who will listen. Running a successful massage therapy practice is not rocket science from a business perspective. Do you want to know the secret? Find out what the client came for and, if at all possible (and ethical/legal) give it to them. There are difficult people who are impossible or nearly impossible to please. But a client who is asking for nice, easy light work from you as a massage therapist? This should have been a slam-dunk. Thank you, please come back again! The events described in this review should just never happen period. I went to massage school in 1995. At the time I was a full-time elementary school teacher, which I still maintain is one of the most stressful jobs on the planet. I had little time to pay attention to my health, but I was always trying to lose weight and manage the health problems I did have. These were: chronic allergies, frequent colds which usually turned into sinus infections, eczema, and chronic fatigue. I tried to manage all this by having allergy shots for 5 years, exercising sporadically, and eating a pretty poor diet when I wasn’t severely dieting or overeating. Of course, I thought I was doing pretty well because I was consuming lots of Diet Coke, eating things like diet margarine and low-calorie everything. I would even buy aspartame in little packets to sprinkle over healthier foods like oatmeal and yogurt. I ate granola bars which featured hydrogenated soybean oil as an ingredient which I thought was good for me, being a vegetable oil. First I started receiving a monthly massage at the local YMCA, then from a local massage therapist I met on a bicycle trip. After a short time I started analyzing this job the MT was doing. It looked pretty nice. I remember saying to her, “I bet you get to concentrate on one thing at a time.” This seemed like a professional luxury I couldn’t even imagine. The next thing I knew I was signed up for a full-fledged professional training program. This was my first step into natural health. I remember the day I learned as an aside from an instructor that soda is bad for your health; she called it, “A heat-seeking missile for the calcium in your bones.” This was earth-shattering to me! I got energized to learn more about nutrition, exercise and natural solutions to health problems. Massage school really was a turning point in my life. I no longer suffer from any of the health problems I had in 1995, really I have no health problems now at all. My diet is life-supporting and very enjoyable. I haven’t had a weight problem for 4 years. It is the first 4 years in my life that I have had my weight under good control. I consume no soda, hydrogenated oil, chemical flavorings or colorings, soybean products, no wheat and only small amounts of other grains and other natural sugars. I exercise regularly, I sleep like a rock and I’m usually in a good mood. I don’t think I’d be in this place health-wise if I’d continued down the road I was on. Maybe you’re ready to step into the world of natural health. Come see us at WSMT and we can get your dream of becoming a professional massage therapist off the ground. And then the sky’s the limit for how healthy and inspiring you will be for yourself and your clients! We practice chair massage at the Washington County Fair each July. Clients enjoy a little break, students practice chair techniques, and the school gets some visibility in the community. Wisconsin passed a Massage Therapy Licensing Law in 2010. Then a board had to be set up and begin to define specific rules for the profession. The first official proposal of rules has been published and are likely to become law. How does this affect MTs in Wisconsin? You should follow the link above to read the rules for yourself, but here are my highlights. The biggest change is there will now be a legal requirement for continuing education - 24 hours every 2 years. 2 hours of this is required to be within the topic of ethics, the other 22 hours must be topics that are within the scope and practice of massage therapy or the business of massage therapy. Also, approved schools in the state will be approved to provide CE hours. What does this mean? Beginning at the February, 2017 renewal, licensees will have to sign off that they completed this CE requirement and have certificates to back it up if audited. Classes will have to pertain to the massage therapy scope of practice. Since energy work is separated by the law from massage therapy I believe this means these things will be eliminated as counting for meeting the requirement. It doesn't mean you can't take these classes and do this activity. It just means it isn't counted as meeting the requirement as continuing education in massage therapy. I must say I'm happy about this. I have seen a lot of questionable class offerings, in my view, that are still counted as continuing education for massage therapy by various organizations. This includes everything from "aura reading to crystal healing." I have never understood how this type of offering would help someone become better at massage. In addition, many people still think it is necessary to maintain national certification through the NCBTMB. Actually, this was never required in Wisconsin, only that you passed a national exam. The new rules would accept continuing education pertaining to massage therapy provided by members of organizations like this, but it is not required that the provider be a member of any organization. In addition there is this little tidbit in there, "Continuing education activities may be in the form of in-person instruction, distance learning, online activities, audiovisual recordings, audio recordings and professional literature review." I really like the idea of a class of professional literature review. I think there is a lot of excellent published musculoskeletal information every year that MTs miss out on possibly because they don't have time nor incentive to delve into the material. This one aspect, in my view, could really elevate our profession from its unscientific roots to become much more effective when utilizing the latest that medical science has to offer. There will be some who scoff at my last statement because they value the unscientific beginnings of massage therapy. Forgive me, I value them too, in that the personal, individual attention and actual physical touch of one person to another can never be eclipsed by science. But I am excited to enhance this basis with true knowledge about what is happening in the body as a result of our work and how we might be able to improve our results. Believe me, the vast hurting sea of humanity would rather we know how to fix their pain than only commiserate with them! Take a look at these rules. They will affect all MTs in Wisconsin in coming years. I will keep you posted on updates and changes as I find out about them. Don't sleep on this one - check it out! ​As part of our therapeutic curriculum, students learn to help people with pain complaints. Anecdotally, we find about half of our clients seek massage for help with a pain complaint. So, getting good at assessing and treating painful musculoskeletal conditions is very important for a successful massage therapist. Two muscles in particular cause students and sometimes professionals a lot of angst: the Psoas in the lower abdomen and the Longus Colli in the throat. The angst is there because working with either of these muscles is not usually very comfortable for the client, and the MT's skill needs to be precise to avoid problems and to be effective. These 2 muscles, though, can be crucially important in relieving specific pain complaints. Our students get the instruction and guided practice to get comfortable treating these tricky muscles. Sometimes clients who have been struggling for years find relief because our students had the skill and confidence to do the work that was so needed. High quality instruction like this is another reason to choose a small school that cares enough to prepare you to be a cut above average. It requires knowledgeable, caring instructors who have the time to do the coaching necessary. It's what we value so much in our instructors and it's what we make sure they have adequate time for. This kind of organizational support for teachers is another reason ours have been with us for years! We still have some room in the September class - call or email and we'll get all your questions answered without any fee or obligation to you. If you choose us we want you to be sure it is the right fit for your educational needs. “I was able to complete all of my requirements within a month of graduating. I felt no pressure, just encouragement to succeed." ​One of the big advantages to choosing WSMT as your massage school is that we care about you as an individual. Sometimes things happen in life which throw up a temporary roadblock to your plans, or you just need a little more time to complete requirements, or ... the list is endless. Being a small, massage-only school affords us the luxury of helping you find a way to succeed in school and move on to licensed, professional massage therapy. We always say, "If you want to do it, we will help you find a way." Mind you, we can't complete the requirements for you, but we can make adjustments and we can cheer you on to make your dream come true. Where there is a will, we find a way! Have you been hesitating because you have fears? Will you be smart enough, good enough, have time or money enough? You can do it and we will help you! We STILL have a little room in the September class. The faster you begin the sooner you will be a Wisconsin Licensed Massage Therapist with great job prospects, dedicated clients, and a steady income. Call us for a tour! 262-250-1276. We have been running a monthly Introduction to Massage Therapy class and it has been a big success! Students pay only $25 for a 2-hour class where they get a chance to learn all about professional massage. For the first hour we just sit and discuss the profession covering everything from the requirements of the state and the school to the current state of the job market. This time gives you a good foundation for understanding what this field entails. The second hour we observe a demonstration of a simplified back massage and then try out the techniques with coaching. This second part engages your whole being as you can begin to imagine what the training would be like and even the work conditions. I always warn students that the hands-on experience often cinches it for the student because this is fun! Already many of the partners on the tables say how good it feels and students begin to see how interestingly complex a quality massage really is. It's not just giving a great back rub! And that is what piques the interest to come to school and to get really good at this. "We recently had two massage therapists (both grads from the WSMT) come to our business and do 15 minute chair massages for our employees. Our employees love when we do this. They even make our boring conference room inviting with their soothing music and aromatherapy! Thanks to WSMT for turning out such amazing therapists! Robin and Rhonda rock!!" be proud to say that I got my training from you and your excellent staff/facility. All good! When I receive feedback like this, I know I am blessed with the best job in the world! By the way, we are now signing up students for our spring classes. The faster you begin the sooner you will be a Wisconsin Licensed Massage Therapist with great job prospects, dedicated clients, and a steady income. Call us for a tour! 262-250-1276. ​This month we have welcomed Miriam Mitchell to our teaching staff. Miriam says when she graduated from WSMT she didn't want to leave. Now she doesn't have to! Mary: Why did you want to teach at WSMT? Miriam: I'm passionate about learning. I have a college degree in Education in addition to my massage therapy training. In massage school my classmates encouraged me to look into combining my two areas of interest because I often helped them by clarifying information from class. Mary: What got you interested in massage therapy? Miriam: I have a strong desire to help others. I'm service-driven and I'm a good listener. I like how massage therapy can be a part of a wholistic wellness plan, helping people to feel better in a more natural way. Mary: Tell us more about yourself! Miriam: I love my family, my 12-year old daughter, 7-year old son, and my husband who has a nursing degree and works for the YMCA. They all love receiving massage! Miriam has already been helping out in one of our night classes. And she is looking forward to the new classes starting in spring too. At this time we say a fond goodbye to another long time staff member, Alesia Streff, who has decided to pursue a different professional path. We wish her all the best! 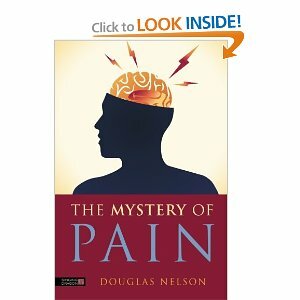 I have found Douglas Nelson's newest book, The Mystery of Pain, so good I have already ordered a copy to give to someone who I know suffers from chronic pain. I have not even finished the book yet! This book explains in very understandable terms the latest research findings about pain and how to be more comfortable if you have it. I'm encouraged that many scientists have been trying to understand pain and how to control it. For a massage therapist this book is so excellent I think every MT should have and read this book. It gives great background as well as concrete ideas for helping clients in pain. I will definitely make this a member of my professional lending library. The biggest revelation for me so far in my reading? Well, I used to think that moving when in pain is good because of the increased fluid flow and feel-good brain chemicals that are produced. While this is still true, I've learned in this book that the brain is intimately involved here. The same mechanism that allows someone fleeing for their life to not even feel a serious injury is at work. The brain can and does turn off pain when it needs to do something important like direct self-sustaining measures in a crisis. When exercising, even though the individual feels pain initially (as with arthritic joints), they feel better as they go along partially because the brain buys in to the idea that this movement is important to the overall well-being of the organism. The brain dampens the pain to allow the movement. I love that word from the book, "dampen," because maybe it isn't gone, but significantly reduced. It reminds me of the client years ago who came in for TMJ pain (jaw pain). This was after numerous surgeries which she said did nothing to change the "drilling pain" she experienced nonstop. Her goal for massage therapy was very modest: to have the pain reduced even a little. Sometimes a person experiencing debilitating levels of pain will be looking for anything. After surgery - such a big decision and life event - and no reduction of pain, this client did not have high hopes for anything working. I think exercise can seem like throwing a little bone to an enormous monster creature attacking you. What is so misleading is how powerful exercise is. It improves the situation on many levels - yes, fluid flow improves, but also, the brain changes how it perceives the situation. This is HUGE!! The next message will continue with insights from this book. It is packed with powerful information. What a treasure for the profession and for people in pain everywhere. "It reminds me of the client years ago who came in for TMJ pain (jaw pain). This was after numerous surgeries which she said did nothing to change the "drilling pain" she experienced nonstop. Her goal for massage therapy was very modest: to have the pain reduced even a little. Sometimes a person experiencing debilitating levels of pain will be looking for anything. After surgery - such a big decision and life event - and no reduction of pain, this client did not have high hopes for anything working." And it is pertinent here because the Nelson book explains how, "Lessening fear and restoring a sense of control is an important step to decreasing pain and restoring function." My client, described above, was fearful that nothing would ever change her pain, and she was not feeling in control of the situation when I first met her. She just was casting about for anything that might help even a little. So here is the end of the story and a great illustration of Nelson's assertion above. I worked on the muscles of the client's jaw. After the first session the pain was actually gone for the day! She was elated, except the pain returned. Now, however, she had hope and a strategy: get massage. So, I worked with her a few more times over the next few weeks and each time the pain stayed away longer. Once the pain would stay away for a week or so, I taught the client how to work the muscles of her jaw on her own. Then I didn't see her for several months. She scheduled an appointment then, and I found out she was doing the massage techniques each morning for about 5 minutes. By doing this, she found out she could keep the pain away indefinitely. She had scheduled an appointment with me for general relaxation because she wanted to see what a general wellness massage was like, not because her jaw needed my skill that day! Maybe you can imagine her glee at being pain free. I believe that I helped the soft tissue surrounding her jaw joint, but maybe more importantly, by teaching her exactly how to do it, I had empowered her to take control of her pain and it turned the situation completely around. This is the joy of massage therapy for me. It is a job that I get paid to do and I'm glad for that. But it is also a vocation in that using knowledge and skills to help others so powerfully is a true privilege. And when a client leaves my office pain free my heart truly leaps! By the way, don't think that it is ever bad for business to give someone the tools to take care of themselves, or to completely solve their problem in the office. When someone has been suffering and you truly helped them they will sing your praises to everyone and anyone they come across who is in pain. Sadly, there are a lot of people out there in pain, but when you help one, that's one more person who knows that massage therapy can be powerful help indeed. Again, I recommend this book to bodyworkers and the general public alike. It can be one tool all by itself for sufferers. Understanding the mechanisms that might be at play in one's own body can be part of the solution. Knowledge is, indeed, power! We had the true joy of graduating another class this week! What does the future hold for these new massage therapists who have spent 10 months working hard in school, paying tuition, and passing the state and national exams to qualify for a Wisconsin license? Well, the future is bright! All of these grads have jobs or are starting their own businesses. Often new grads are surprised that they have skills that are in high demand and the process of choosing a job puts them squarely in the driver's seat! How can this be? Isn't the economy having an effect on clients' being able to indulge in the luxury of a massage? Ha! No! Massage is not a luxury expenditure for many, many clients. First, many clients seek massage work for specific pain they are experiencing. Second, those who come for relaxation find the stress reduction greatly contributes to their health. Often, regular massage work becomes a wellness-maintenance expenditure which is much more important to clients than true luxuries. So, we have found that the employers in the area are clamoring for high quality, licensed massage therapists. We consistently hear from employers that our graduates meet their clients' needs, that they really care and have excellent skills. WSMT is a boon to have on your resume because all schools are not the same. Our concise curriculum gets you a solid foundation quickly from which to work with real clients, we focus only on massage training, and we teach you to use comfortable body mechanics to keep yourself healthy while providing the best massage work for your clients. One of our recent graduates, Laurie, sums up her experience this way, "The staff are like family and they really help you to understand the science behind massage and they want you to be the best you can be at massage so you can fulfill a lifelong passion of helping others." 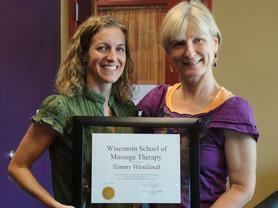 Have you been thinking about becoming a Wisconsin Licensed Massage Therapist? You won't find a school more devoted to your success! We are very excited about our newest class offering; the accelerated class! This class will immerse you in the world of massage therapy because you will have 3 full days per week to study and practice. Because the class meets more per week than our other classes, the whole program will be completed in only 6 months! Each week you'll learn more about how the body works, you'll develop manual techniques to help human tissue function normally, and you'll meet and connect with other students who love natural health like you do. It's no accident that our students consistently tell us how much they enjoy coming to class! We know we are doing this well when that is the overwhelming sentiment of our students. I can't think of a better Christmas present to yourself or New Year's resolution to actually achieve than by joining this accelerated class. Have you been thinking about becoming a Wisconsin Licensed Massage Therapist, but you've just been putting it off? Have you been hesitating because of the year-long commitment it usually takes? Then this is the class for you! You won't find a school more devoted to your success! By the way, we are now signing up students for all our spring classes. The faster you begin the sooner you will be a Wisconsin Licensed Massage Therapist with great job prospects, dedicated clients, and a steady income. Call us for a free tour at your convenience and on your schedule! 262-250-1276.